From the vantage point of a nearby pond in Newton, Massachusetts, Diana Muir reconstructs an intriguing interpretation of New England's natural history and the people who have lived there since pre-Columbian times. Taking a radically new way to show general readers the interrelationships between natural ecology and human economics, Muir weaves together an imaginative and dramatic account of the changes, massive and subtle, that successive generations of humankind and such animals as sheep and beavers have worked on the land. Her compelling narrative takes us to a New England populated by individuals struggling to live off a land not generously endowed by nature. The areas history, she argues, was a string of ecological crises from which the only escape lay in creating radical new solutions to apparently insurmountable problems. Young men and women coming of age in the 1790s faced a bleak future. In a time when farming was virtually the only occupation, a burgeoning population meant that there was not enough land to go around. Worse, such land as there was had been worn out by generations of careless use. With no prospects and no options, men like Eli Whitney and Thomas Blanchard might have resigned themselves to a life of poverty. Instead, they started an industrial revolution, the power of which astonished the world. 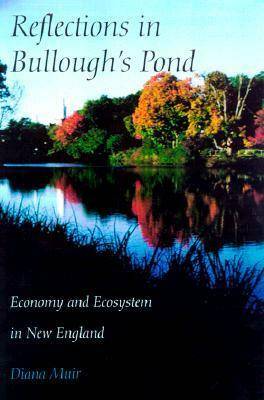 Reflections in Bullough's Pond is history on a grand scale. Drawing on scholarship in fields ranging from archaeology to zoology, Muir offers an exhilarating tour of Paleolithic megafauna, the population crisis faced by New England natives in the pre-Columbian period, the introduction of indoor plumbing, and the invention of the shoe-peg. At the end, we understandourselves and our world a little better.